Q: My JR Carbine is having feeding problems. What should I do? The JR Carbine is designed to use either genuine Glock or M&P magazines. Aftermarket Glock-compatible magazines or M&P magazines may not perform properly or consistently. Even genuine Glock magazines have gone through several generations, and they may not all perform the same. See our comparison of two Glock magazine springs. Glock-45 ACP Magazine Adjustment: On occasion, we have experienced a feeding problem in some 10-round .45 ACP Glock magazines. Specifically, the last 1-3 rounds consistently stand straight up on the follower and do not feed into the chamber. We have traced the problem to the follower spring, where the top of the spring is formed in such a way that it applies most of its pressure on the front end of the follower and little, if any, on the back. In turn, the follower pushes upward unevenly on the cartridge – mostly on the forward half. When the bolt contacts the top round of ammunition and begins driving it forward, the unbalanced pressure on the front of the cartridge permits the cartridge to rotate upward as the cartridge case clears the magazine feed lips. Over-inserting the Magazine: Feeding problems are occasionally caused by shooters inserting the magazine too far up into the magazine well. This issue occurs with an old style of feed ramp which is flat in design. The current design of the ramp has a built-in stop which prevents this issue. If you have the older style, flat feed ramp, contact us and we will send you out a new style at no charge. Not all ammunition is created equal. Although all JR Carbines are manufactured and assembled to the same specifications and tolerances, any individual firearm is likely to tend to prefer one brand or type of ammunition over other, and the JR Carbine is no exception. In most cases the reason is variations in ammunition manufacture – even between lots of ammunition from the same manufacturer. If you are experiencing feeding difficulties unrelated to the magazine, consider trying different types and brands of ammunition to determine which performs best in your JR Carbine.just as with virtually all other firearms. Differences in bullet profile, case diameter, and bullet composition (cast lead bullets are not recommended) can significantly impact ammunition feeding. Q: When will you offer the JR Carbine in 10mm? Your wish is our command. Your favorite JR Carbine is now available in a 10mm Glock magazine model! Offered Black only and in all 4 configurations (Standard, California, Restricted, SAFE Act), now all that extra firepower is yours. Do you have any plans to make the 9mm compatible with other (Sig P226, Beretta M9, etc.) magazines? We base our JR Carbine model offerings on magazines that have proven most popular among the general shooting public. Currently that means Glock magazines (in 9mm, .40S&W, and .45ACP) We have just announced (Q1 2014) S&W M&P magwells for the .9mm and 40 S&W calibers. We are currently evaluating our product mix relative to market demand, and we will continue to consider adapting the JR Carbine to other magazines. Q: Can I shoot Plus-P (+P) ammunition in my JR Carbine? It should not be a problem for you to use Plus-P ammo in your JR Carbine. We initially prohibited Plus-P ammunition because the JR Carbine is a direct blowback weapon with a non-locking bolt. The added power of Plus-P ammunition caused a significant increase in gas discharge through the ejection port without giving any ballistic advantage over conventionally charged cartridges. We were concerned that the higher power ammunition could cause the bolt to move rearward too soon in the firing sequence, before the chamber pressure had dropped sufficiently, thereby prematurely exposing the case wall and causing potentially dangerous case failures. We have subsequently modified our bolt design and significantly increased the weight of our proprietary buttstock buffer. As a result the bolt stays in battery for a longer period, directing more of the combustion gases into the barrel and out of the muzzle. Plus-P ammunition may or may not provide a significant increase in performance at this point, but it should not cause any problems. Q: Which aftermarket buttstocks will fit my JR Carbine? There are too many aftermarket stocks on the market for us to maintain a list of all that are compatible with the JR Carbine. However, with the following information you can pretty well determine whether any particular stock you might be interested in will fit your JR Carbine. The JR Carbine receiver buffer tube threading accommodates both commercial and mil-spec buffer tubes. Either will install with the threads provided . The major dimensional difference between commercial and mil-spec tubes is that the commercial tubes have a greater outer diameter. This is due to the mil-spec tubes being manufactured from a 7000-series aluminum alloy, which allows for thinner tube walls, while commercial tubes are usually made from 6000-series alloy, requiring somewhat greater wall thickness. JR Carbine buffer tubes as of late 2013 are longer length compared to a std AR style buffer tube. This extra length is required to accommodate our larger buffer. The way to find out if you have a larger buffer in your gun is to collapse down the buttstock. If it touches the castle nut and the back of the receiver, then you have a shorter tube. These will be primarily found in 9mm guns. The 9mm works just fine with a shorter buffer, but it also works great with the larger buffer. Where you see a difference is in the 40 S&W and the 45 ACP. Those calibers require a longer, heavier buffer to function properly. Because of this, the tube we have made are 1.5″ longer to allow for the extra length needed to house the bigger buffer. So, when you collapse down a 40 S&W or 45 ACP buttstock, you will see it is about 1.5″ away from the receiver. JR Carbine buttstocks use commercial grade buffer tubes. These will accommodate mil-spec tubes, but the stock bodies will fit somewhat loosely on the mil-spec tubes. One usually cannot match up a mil-spec stock body with a commercial buffer tube, however, because the greater diameter tube will not fit within the molded stock body. While it is recommended you do NOT change your buffer tube from the factory, if you do….You MUST ensure that the internal buffer tube depth of the replacement stock does not vary more than 1/8th of an inch from the depth of the buffer tube your JR Carbine was supplied with. You MUST ALSO ensure that you use ONLY the internal parts (buffer/spring/nylon disc/rubber bumper) that came with your original JR Carbine buttstock. Set aside any internal buffer tube parts that came with your aftermarket stock and do not install them on your JR Carbine. 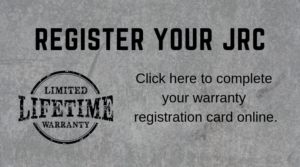 If you try to use them instead of the proprietary parts provided with your JR Carbine…..or you leave the JRC parts out trying to gain space for the longer buffer, your carbine will break and require repairs – which will not be covered by warranty. If you need replacement bumpers and spacers, we offer these on the parts and accessories page of our web store.